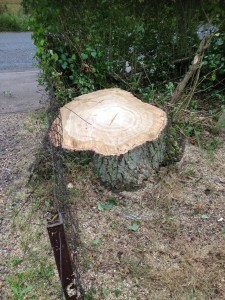 Tree stumps are the part of the tree left after it has been felled and depending on the size of the tree that was cut they can take up a large amount of room on your land. Tree stumps can also regenerate if the conditions are right. When this happens, small tree sprouts grow from the stump and use the existing root structure for nutrition. If the felled tree was large there may have been a huge amount of nutrients left in the roots and this can cause the shoots to grow very fast this quickly, leading to a very unsightly addition to your garden. 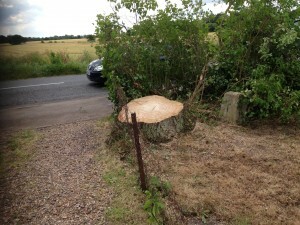 There are several hazards related to leaving tree stumps in your garden after cutting trees down. For example, the UK’s most destructive fungal garden disease Honey fungus (Armillaria) thrives in the rotting wood of dead trees and can cause the deaths of many of the nearby trees and other plants. If Honey Fungus has begun to spread in a garden the only remedy is to excavate all of the infected plants and then either burn them of have them put in a landfill. Another related hazard is that the stumps may become overgrown and act as camouflaged tripping hazards. If you are own a public garden this could lead to customers getting hurt which is bad for business. Perhaps the simplest problem with having tree stumps in your garden are that they take up room and are an eyesore that detracts from the beauty of your garden. need to fill in a large hole. After we have ground down the stump to a sufficient level we can then lay down turf which leaves your ground looking good as new. The final method that we use is chemical removal where we use chemical that breaks helps the dead wood break down faster and decompose on its own. This does minimal damage to the area around the stump, however, it can take a while for the stump to decay completely.